In case you need to fill the blank cells within a range with the data above it , use following macro code. Since this works on pre selected range of data, so make sure that you have selected the required data range before running your macro. Let us take an example. if you want to fill the blank cells with in range "A2:D10", make sure that you have select this range before running the macro. Please also refer to earlier post on "How to fill blank cells in excel data range with cells above it"
In case you need to select blank cells within range , use following macro code. Since this works on pre selected range of data, so make sure that you have selected the required data range before running your macro. Let us take an example. if you want to find blank cells with in "A2:D10", make sure that you have select this range before running the macro. Visual Basic is object oriented language, it means all items in Excel are considered as objects. There are lots of them but following example will help us understand what an Object is. In a Macro Range("A1") is an object. An object can contain other objects. WorkBook is the larger object followed by WorkSheet and Range. There is no difference in the previous line and line above in your macro code. In case you do not refere larger object, Excel Macro will use ActiveWorkBook and ActiveSheet. So if you write Range("A1") it means same if you have your cursor at Worksheet "Data" in "Macros Book.xls" file while running this code. Sheets(1) - Referes First sheet on tab bar. A macro records your mouse clicks and keystrokes while you work and lets you play them back later. You can use a macro to record the sequence of commands you use to perform a certain task. When you run the macro, it plays those exact commands back in the same order, causing Excel to behave just as if you had entered the commands yourself. Certain precautions while recording a macro will help you generate a code which will run every time you are using that macro. One major issue when you download data from source system for further processing is the sheet name. It is different every time you download data. 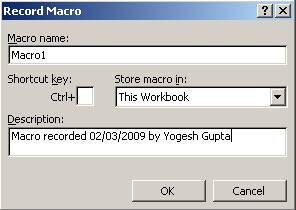 Since the macro recorded by you will record the sheet name as available at the time of recording of macro. Same macro will not work next time as the sheet name for downloaded data will be different. To make it work you need to change the sheet name to generic name as first step while recording your macro. See the code below which is recorded to change the sheet name as first step. This helps to record the same name in macro in the next step when you flip through the sheets. A small change in the first line of the code will help you run the macro without worrying about the sheet name of downloaded data. If you are recording macros for the first time make you "Visual Basic" toolbar visible as it comes handy for recording. Once you have this visible you are ready to record a excel macro. Click on to start recording. Once you have clicked , system will prompt with Record Macro dialog box as seen below. Before you record or write a macro, plan the steps and commands you want the macro to perform. If you make a mistake when you record the macro, corrections you make are also recorded. When you record macros, Visual Basic stores each macro in a new module attached to a workbook. Once you are through with all the steps , you need to stop recording by clicking on . Now your macro has been created by Excel using a programming language called Visual Basic® for Applications (VBA) to record your instructions. You don't have to know anything about programming or VBA to create and use macros. If you are doing a task again a again in excel you can automate it with a Marco. If you receive a data every day/Week/Month that you analyse the same way every time, you can create series of commands in shape of excel macro and do that task by single command of running that macro and completing your task by single click of mouse.